The honey as 500mg full spectrum CBD oil. It is raw and local to Louisville, never filtered, FDA approved and slightly flavored with organic ginger essential oil. This honey comes in two flavors - "Natural" and also "Ginger" which is slightly flavored with organic ginger essential oil. Please tell us which flavor you prefer in the notes section of your order. This CBD Honey is compliant with Farm Bill 2014 and was approved by KY Dept. of Agriculture. 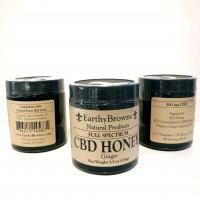 The Hemp (CBD) extract used in this product was grown under the KY Hemp Pilot Program. The hemp was harvested, extracted and packaged in KY. This product was packaged in a commercial kitchen with a state permit. Hemp (CBD) extracted with organic alcohol. All base oils in product are certified organic. Each 5.5 oz jar contains 500mg of full spectrum Hemp (CBD) extract.